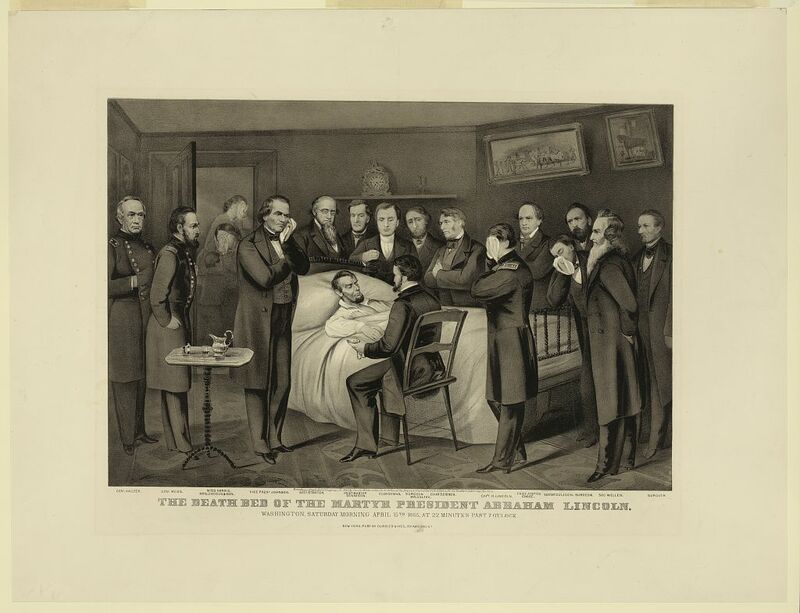 The Currier & Ives print depicts Lincoln's deathbed with 18 people gathered around. Their names are listed at the bottom of the image. Genl. Halleck, Genl. Meigs, Miss Harris, Mrs. Lincoln & son, Vice Prest. Johnson, Secy. Stanton, Postmaster Dennison, clergyman, surgeon, Mr. Colfax, Chas. Sumner, Capt. R. Lincoln, Chief Justice Chase, Sec. McCulloch, surgeon, Sec. Welles, surgeon.